It’s 50 years today since the late Northern Irishman won his first league title with Man United. George Best pictured as a youngster. MANCHESTER UNITED LEGEND George Best — unquestionably one of the greatest players ever and arguably the first-ever footballing celebrity — has, over the years, become a cliché, a by-word for ‘cautionary tale’. Yet the truth is naturally far more complex than this cartoonish image of him suggests, as a book by acclaimed sportswriter Duncan Hamilton explains. One of the predominant theories of Hamilton’s biography of the star goes against the grain of common thought — namely, that George Best’s career faded fast primarily as a result of his undue love of alcohol and other forms of excess. Instead, Hamilton firmly believes that it was Best’s lack of success on the football field (when measured by his incredibly high standards) that drove him to alcohol. “There are several myths about George — some of which he liked to push himself,” Hamilton says. 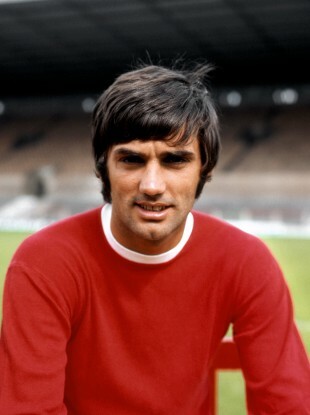 “I think the biggest myth about George Best is that drink brought an end to his football career. It was the football that led him into drinking. There’s no doubt about that. Best’s rise had been meteoric. The Northern Irish footballing legend was signed by Manchester United at 15, before making his first-team debut at 17 and scoring on only his second appearance for the club. The player’s impact thereafter was even more phenomenal, having played a considerable role in helping United to two league titles and a European Cup by the age of 22, also claiming the Ballon d’Or and becoming the youngest-ever Footballer of the Year winner in the process. And Hamilton was one of millions who would regularly fantasise about replicating Best’s talents on the football pitch. The decline of both Best and United was stark thereafter. He claimed to be carrying a team in which a series of new signings flopped, leading to the club’s eventual relegation and Best’s acrimonious departure in 1974, aged just 28. He would go on to play for a number of low-profile clubs such as Stockport and Cork Celtic, but never consistently captured the form that briefly made him the best footballer in the world. “As the United side began to disintegrate, that’s what sent him towards the bottle,” Hamilton explains. “He was too much of a perfectionist. I think that was his problem after 68/69. He wanted to be number one. Being number two was absolutely mournful for him and being three or four — as Manchester United then were — was absolute pain. He couldn’t cope with that. He had this absolute obsession — this need to be perfect and to go and win every game. And the idea that football itself, as much as alcohol, ruined George Best, is not the only highly intriguing insight in Hamilton’s book. Contrary to popular belief, not all footballers back then were earning modest amounts of cash, with Best being a prime exception to this rule. One of the reasons why his United career ended in such acrimony was owing to his tendency to pull no-shows and go missing from training for several days, instead opting to go on intensive drinking binges. Back then, the notion of media training was inconceivable and players weren’t groomed for superstardom as they are now. Consequently, the once-shy teenager from Belfast was finding his sudden celebrity status increasingly difficult to deal with. “What else surprised me was the sheer level of fame and the unfortunate circumstances which it led to,” Hamilton recalls. “I don’t think that people appreciate that by 1970, this was a man under severe mental pressure. Hamilton — whose intensive research involved going through around 5,000 press clippings and 500 books, in addition to interviewing over 100 people and viewing more or less every piece of footage in which the late star appears — believes Best would not have encountered such problems were he a modern footballer. At his peak, Matt Busby oversaw Best’s development — and the legendary manager was of a different generation to the precocious Northern Irishman and very much his polar opposite in terms of personality type. And while Hamilton is reluctant to attach significant blame to Busby, he feels the manager could have done more to curb the player’s decline. “I think he made a crucial mistake right at the start in assuming that a teenager in the 60s was the same as a teenager in the 50s. In the 50s, he’d taken Bobby Charlton to one side after he heard that he had a glass of beer before he was of a legal age to drink. But he only had to tell Bobby Charlton once. All the problems started with George in 1965, and he left him out [of the team] early in that season because he’d been spending too many nights at parties. And so, given the ignominious end to his career, did Best essentially consider himself a failure for the remainder of his life? “I don’t think so — because I don’t think he was that way inclined,” he says. “I think he always thought that he should have played for Manchester United for longer. He saw his future as being at his peak at 29 and playing for Manchester United, and actually playing well into his 30s. I don’t think he ever got over leaving Manchester United really. Nothing gave him that level of satisfaction. In many ways, Best’s career trajectory mirrored that of legendary coach Brian Clough, whose managerial style brought endless success to both Derby County and Nottingham Forest at first, yet he retired in similarly humiliating circumstances, having overseen the latter’s relegation from the Premier League. Hamilton previously worked on a book about Clough for which he received the William Hill Sports Book of the Year accolade. So with this in mind, does he see similarities between the two characters? “I suppose really, Brian began drinking hard in the late 80s when he was under a lot of pressure,” he explains. “And it was the same for George in the 60s. But they were different people in the sense that Brian had a very stable home life. He was very much a family man. And of course, George wasn’t. It was said that George had slept with 1,000 women before 1969. And I assumed that that figure was just one of those newspaper-talk figures. And I said to his friends: ‘what is the real figure?’ and they said: ‘well actually, probably more than that.’ So it was a conservative estimate. And even though defenders have gotten fitter and modern football is vastly different from its earlier incarnations, Hamilton is adamant that Best would have excelled had he come along today, and says Lionel Messi is the one player who reminds him of the Northern Irish legend. And does he feel it’s still possible now for kids to idolise and obsess over star footballers, as he once did with Best as a youngster? ‘Immortal’ by Duncan Hamilton is available to buy. Further details can be found here. Email “‘The biggest myth about George Best is that drink brought an end to his football career’”. Feedback on “‘The biggest myth about George Best is that drink brought an end to his football career’”.